I am running an ordered logit model with 3 outcomes: -1, 0, 1. And the evaluation of the results yields the followinf. 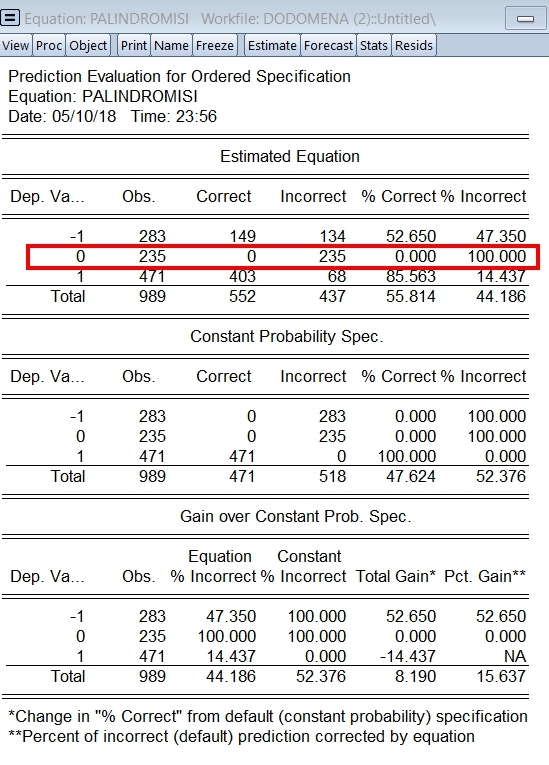 The problem is the model never predicts and 0's it just predicts -1 and 1 values... What is wrong? In this type of model it is certainly possible that the highest predicted probability never matches the actual realization. This problem becomes more acute the greater number of possible outcomes in the speicfication. In this case, the highest fitted probability is always for the dep=1 category, undoubtedly due to the large relative number of dep=1 observations in the sample. The variation in the explanatory variables will shift the relative fitted probabilities around toward better fitting the observed dep, but doesn't necessarily make the realized state the highest fitted probability. EViews Glenn wrote: In this type of model it is certainly possible that the highest predicted probability never matches the actual realization. This problem becomes more acute the greater number of possible outcomes in the speicfication. In this case, the highest fitted probability is always for the dep=1 category, undoubtedly due to the large relative number of dep=1 observations in the sample. The variation in the explanatory variables will shift the relative fitted probabilities around toward better fitting the observed dep, but doesn't necessarily make the realized state the highest fitted probability. Thank you Glenn for the response! So what can I do now to fix this? ie get a more realistic model that predicts all three states? The model is what it is. If you have a better model, then you can use it instead. Adding explanatory variables may help, but that may lead to overfitting. And in a case where 99% of observations have the same response, there is not much that one case do. You may want to generate the individual response probabilities and work with them directly instead of just looking to see which one has the highest value. EViews Glenn wrote: And in a case where 99% of observations have the same response, there is not much that one case do. The 99% was a generic comment, not specific to your data (which I haven't seen). What I'd recommend is that you make a model from your equation and solve for the fitted probabilities and examine them. I do note that your 0 category is the least frequent, and though you most certainly have fitted probabilities that are non-zero, it is not out of the realm of possibility that it is never the highest predicted probability category. Notice that the effect of adding the regressors is to move some predictions from 1 to -1.